Bad connecting flights meant a full day stop at Bangkok. So, we took the opportunity of roaming around the city. Twenty four hours is too short for anything, but we are glad to have seen Bangkok's most famous Buddhist temples and cruise on the Chao Phraya river. The unique architecture of their temples is something that I had only seen in the movies and photographs before and to be there in person is a much different experience. And as always, photographs cannot to any justice to the grandeur of any place - wild or man made - and you just have to be there to feel it. Motorbike Taxi!! Makes sense for a person traveling alone. The Golden Buddha at Wat Trimitr - 5 tons of solid gold! 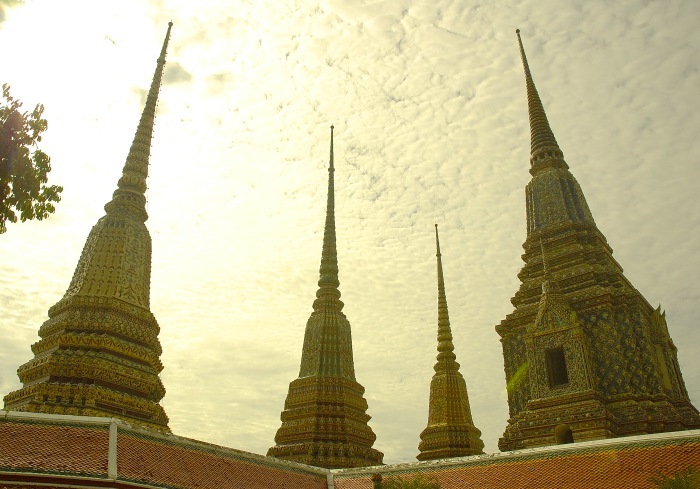 Chedis at Wat Pho. Chedis are built to commemorate great Thai kings and these four Chedis were built to honor the first three Chakri kings. They are like pyramids in a sense except that no bodies or human parts are inside the Chedi. The art of the Thai massage illustrated on this ancient wall. Wat Pho's most famous Buddha - the 50 meter(!!) gold plated reclining Buddha. This is absolutely fantastic photography. It actually looks better in your photographs than it did to my own eyes. You took so many excellent photographs in just a single day! As an aside, I can't believe you did, in one day, what took me a week! > As an aside, I can't believe you did, in one day, what took me a week! Wildlife or buildings, whatever you turn your cameras on becomes magical. A glorious glimpse of Bangkok!! These are amazing - thank you. Thanks for the virtual voyage! Those were gorgeous! > How did you capture them in the angular fashion? That's usual wide-angle stuff. I just went down on my knees to get more of the sky. Since you keep saying you are not a professional, you do this out of love, tell me what I must do in order to get some prints from you? I would be so happy to pay printing costs, postage costs, whatever it takes. The simplest (quickest, easiest and probably the best) way is for me to email a larger resolution picture and you can get in printed in any studio in Sweden. Wow, wow, WOW! You got some great photos for only one day. They're all terrific but the night shots were awesome. What a beautiful place! These places look fabulous though i must agree that spiritual places dont attract me much. Breathtaking..especially some shots in the boat!! stunning pics! are you travelling alone? whats ur iternary like? Oh, I'm back in namma Bengaluru. and of course the photographs are excellent, you seem to have packed your day to great advantage to you..and to us! hey, very nice pics, thanks for posting!